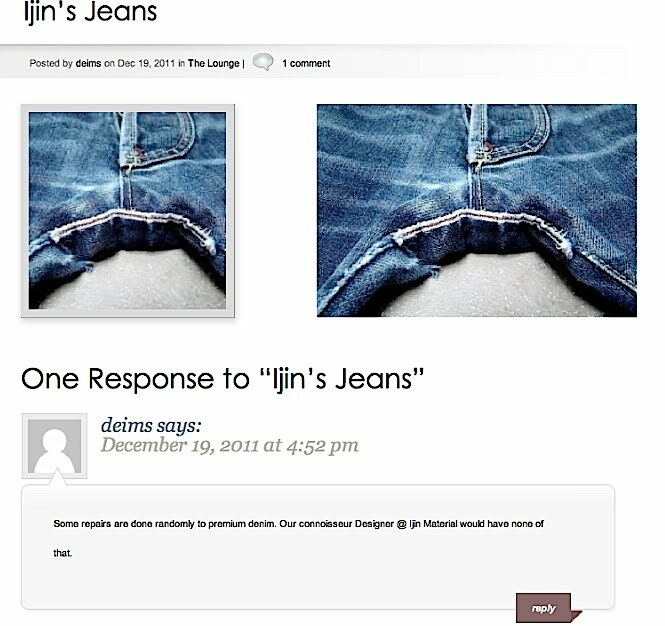 Ijin Material is a highly original denim research product presented by independent jeans-maker & Englishman, Philip Goss. Ijin ''Irregular Indigo Items'' purposely distort the rules of denim know-how,with the clear intention of presenting the classic indigo leg in a contemporary & ingeniously alternative way. Staying ever-faithful to traditional methods of jeans-making but specifically avoiding simply making denim replicas (*check 'My Profile' for explanation), the Ijin product has been sewn by the exact same artisinal production line & craft worked in an Italian workshop, since 2003.The Ijin label is easilly identified by the ''Half-Man'' logo, a reference to the signature method of cutting the denim symmetrically folded & in single cloth pieces. Ijin indigo is highly technical ''stealth-denim'' which appears deceptively historic, especially after ''seasoning'', which is an Ijin term for having worn-in dry denim for at least 9 months before laundering. ''Ijin'' is an archaic Japanese word which was once used to describe someone as an 'outsider' ,'black sheep' or 'alien'. It can also mean 'hero'.